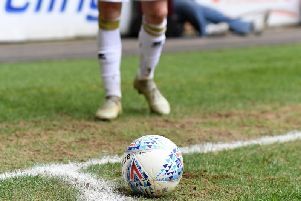 Karl Robinson feels officials are costing Dons every time they walk out onto the pitch after another dubious decision cost them a share of the points at Fulham on Saturday as they lost 2-1. With the match finely poised at 1-1, Alex Revell broke on goal to beat keeper Marcus Bettinelli only to have it scrubbed off for offside. Dons were fined by the FA for their conduct after Kyle McFadzean was sent off last time out against Brighton, and frustration is growing in the Dons boss after they fell four points adrift in the race for Championship survival. He said: “At 1-1, against a very good side, we’ve had a good goal wiped off. It was onside. We didn’t appeal it because my players have been fined by the FA for surrounding the referee. “The FA fined us after the Kyle McFadzean sending off. We’re trying to learn our lesson, but when we do, we get punished. “It’s frustrating, but the officials are costing us, big time. Ross McCormack fired Fulham into the lead nine minutes into the second half when he tapped in Moussa Dembele’s cross, only for Josh Murphy to equalise with a fine lob nine minutes later. McCormack returned the favour though with 15 minutes to go, teeing up Dembele to win it for the home side. Though it leaves Dons four points from safety, Robinson feels his side are in control of their own fate with seven matches to go. “One player is worth more than my whole squad,” said Robinson. “But today, money and everything else was thrown out of the window. “We’ve got to hold on to our nerve and our bottle, we have to work hard for each other. There are a lot of positive to take out of the game today, even though it’s hard to take. We’ve been dealt a very harsh card again. “We need to keep together and dust ourselves off. We’ll never stop. Today we made two mistakes - we gave the ball away and then got caught under it. We got punished.